Jennifer Hudson is a well known American singer and has lots of fans. She is also a good actress and spokesperson. She was born on 12th September, in the year 1981. She became a well known personality in the year 2004, when she was a finalist in the third season of American Idol. She got the seventh place in this event. She got Grammy Award for her debut album, ‘Jennifer Hudson”. She was also given awards for her acting. Recently she has made everyone stunned by losing weight and showing off her hot new body. She succeeded in losing as much as 80 pounds of weight, but she did not take any short cuts to achieve this amazing goal. She did it as it should be, taking time and being patient. She worked really hard to make her body as she desired it to be. Now she looks healthy and beautiful, and wherever she goes, she attracts the attention of all. She looks gorgeous in all dresses she wears and is the centre of attraction at all events she attends. 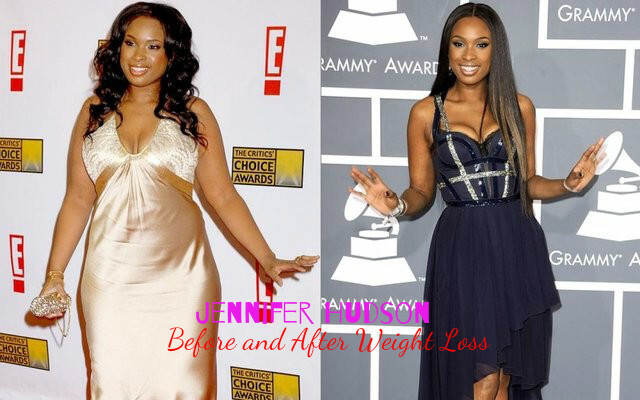 How did Jennifer Hudson Lost Weight? When Jennifer came into the limelight with her new figure, everyone wanted to know the secret behind it. The news about her new figure spread all over the world and everyone was eager to know how she managed to lose weight so effectively. She trained under the famous celebrity fitness trainer, Harley Pasternak, and followed a healthy and balanced diet. This helped her in losing those extra pounds she had gained after the birth of her son, and at the same time kept her healthy. In 2010, she became a spokeswoman for Weight Watchers. According to her, dieting is not that much important in losing weight as is the lifestyle you adopt. Some basic changes in lifestyle can help you lose weight and remain healthy. She says that she was comfortable even when she had put on weight, but she is happy with her present body as well. Jennifer managed to lose 80 pounds and went from wearing dress size 16 to 6. So, reading this article is certainly going to help you. She found Weight Watchers and this helped her lose weight in the correct way. She was motivated by the diet plan of Weight Watchers, which emphasized on losing weight in a healthy way. Here you need not starve. All you have to do is to eat healthy. Have a healthy eating habit and eat well. The fitness routines she followed were supervised by the celeb trainer Harley Pasternak. The workout done was for about 25 minutes per day. Since the time spent on workouts was very short and time saving, it was a favorite among most of the celebrities. The workout included cardio, abdominal, lung exercises and so on. It was done for five days a week. Jenifer worked up to 50 minutes and then she did an additional 25 minutes of cardio workouts. Her workouts were intense and she even practiced basket ball as a part of her fitness regime. She did not follow crash dieting, but had a control over the portion of food she consumed every time. So, she lost weigh sensibly, without harming her body in any way. In fact, she is more healthy today and looks fabulous. Her fitness regime was not very tough and you can do it easily at home. You need not need a personal trainer for doing these exercises. Just follow the weight loss diet plan of Jennifer and do the workouts. You will soon start getting positive results. When it is easy for you to have all food that you fancy and remain inactive, you are bound to gain weight. Losing the weight thus gained is really a challenge under such a situation and Jennifer decided to take this challenge. Motivation is of prime importance when want to lose weight and stick to your decision. No matter whatever weight loss program you choose, you can follow it and be successful only if you get motivated. For Jennifer also this proved to be true. Here you can see how she remained adamant all through her weight loss program. She reminded herself that her health was her responsibility. According to her opinion, if you really want to reach your goal, you have to do all that is possible and that too for yourself. You are not doing it for somebody else. It is for you alone. She made sure that the fitness regimes she underwent worked well for her and her life. She was very serious in achieving her goals and getting the maximum out of it. According to her opinion passion, drive and commitment are of great importance when you follow any weight loss program or any other goal. This helped her to lose weight effectively and maintain her newfound figure. In order to maintain the weight she had worked hard to achieve, she made changes in the way she thought and acted. She made sure that she maintained her new weight and made her health better as well. This way, her whole life changed for the better. Unlike a few celebrities who took the short cut to lose weight and even underwent surgeries to look slim and beautiful, Jennifer Hudson stands apart by choosing the right and sensible way. She has inspired a lot of young women who wanted to lose weight. She is a role model for many women and according to her, you can achieve anything you want if the wish is strong enough and you work hard to achieve it. You are what you think. So, you can have the world at your feet by taking full control of your body and mind.